Stella Maris, Virgin Mary, Star of the Sea, protecting sailor-men and …we seafarers! An event at Golfo Paradiso in the first Sunday of August. 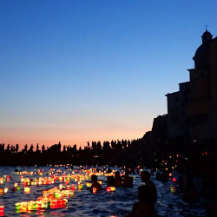 We love this summer religious feast and we suggest you to join Camogli from sunset on. By car : reach the hill of Ruta around h. 10:00 pm: a sea of thousands trembling floating lights is in front of you. Or by train, then on foot up to the promenade and the pebbles beach for the candles distribution. The Dragun (traditional boat) and many other boats sail back from the caper where the Stella Maris altar stands,(Punta Chiappa) and stay anchored facing the village…in the meanwhile local people leave the “Lumini” start floating , moved by the sea current, in some time they enlighten the bay. By boat service we enjoy the scene from the sea, wrapped by the dawn and then the darkness of the summer night. Don’t miss it! and ask us for suggestions of visit.